Kyle Shanahan on Mike Shanahan: "He’ll have an office attached to my office." This is the transcript of Kyle Shanahan’s Wednesday press conference, courtesy of the 49ers’ P.R. department. How do you think practice went yesterday? What did you like out there? Your dad’s been here the couple times we’ve seen. Obviously, he’s an observer. Is he, do you guys talk in shop much afterwards? Do you consider him part of your staff? What areas, just a few months into this job, have you leaned on him so far and try to see, have there been any situations where you go to him for counsel? Talk about going 1,000 miles an hour, you’ve basically been doing that since training camp with the Falcons last July. So, what do you do these next few weeks? You had a couple big plays yesterday offensively using play-action. How important is that overall to your offensive philosophy? S Eric Reid said the toughest thing about going against your offense was being able to discern a running play versus play-action. Is that the most important thing for you when you’re coaching that up? I think one of the explosive plays was WR Marquise Goodwin sprinting down the right side. He came in notoriously fast. How fast has he looked to you and how’s he coming along? You’ve had him now, it seemed like he was kind of limited in what they asked him to do with Buffalo. Are you trying to figure out exactly how you can use him, what variation of routes he can run? Another one of the big plays yesterday was to TE George Kittle. Is he showing you what you hoped to see so far? For training camp, do you want it more physical or do you want the guys to not get hurt? Do you want them to go, not through the motions, you have some competitions going on, but you’ve been part of different styles, your take on training camp? So, if guys get nicked up will you change the tone of it or you’re just trying to get guys in shape? As far as your dad, do you anticipate him also being here around training camp and the regular season here and there? Did you give him an iPad to look at everything? You’ve got three straight road games and the last two are, what is it, Indy and Washington? Have you determined, are you just going to come home after the Indy game or do you know? Have you guys taken LB Reuben Foster in for any updates, MRIs, or anything? You expect him to be first day pads, go on, and he would be ready? TE Garrett Celek had a nice reception yesterday between two defenders. Can you talk about him? You were a big fan of WR Trent Taylor. How has he come along? Has he been everything you had hoped so far? Last training camp one from me, would you ever consider moving it somewhere away from the facility? Have you been a part of that? Speaking of breaking up the monotony, is that why those joint practices, or one of the reasons the joint practices are so important? With all of the rotating you’re doing along the offensive line, is it difficult to project those guys given that there aren’t pads and you’re sort of limited with what you can do physically? Have you seen this team get tighter over the last couple of months? Last week, at the State of the Franchise stuff LB NaVorro Bowman let it be known that T Joe Staley won an award for the offseason conditioning, training or whatever it was. Can you specify what that was and whether any other awards have been given out for offseason? You’re still relatively early into being a head coach, but in the first couple of months, are there things that have become easier or more comfortable or surprises? With CB Rashard Robinson and LB Ahmad Brooks missing practice, you have praised them recently for what they’ve been able to do within the defense. Is giving them time off sort of, I don’t want to say a reward or you’re comfortable with where they are at, but is it kind of telling that these guys have played well and we just want to make sure they’re healthy going into camp and this extended off period? I knew Big Shanny would be a consultant, and it’s like a guarantee. Makes me feel all warm and toasty inside. Like the fruit basket you are! It’s like we got the full Shanny in all the best ways possible. York went Full Shanny, and I respect him for that. I feel like if they can’t get us another Super Bowl, probably nobody can. We need one badly. Not only because we’re falling behind, but we need to get rid of the stench from the last one…. Hear, hear! Can’t have the Giants and Warriors hogging up all of the modern day Bay Area championships. for most, If not all 5 SB victories….we held training camp in Rocklin CA, just outside of Sacramento. I believe this gave us a tremendous competitive advantage…….due to the sizzling Rocklin heat!!! “training camp” was a REAL camp. Guys doing 2 a days in the Rocklin heat gained the stamina to compete for 60 minutes every game……and make deep play-off runs year after year! The team has been soft ever since they gave up training in Rocklin in favor of more favorable bay area climates. Please get back to the roots or our glory years Kyle, Jed and Lynch!!! The new-look 49ers will get some valuable together time before training camp. On Wednesday, quarterback Brian Hoyer told the media the offensive players are organizing a throwing session for later this summer before training camp gets started. 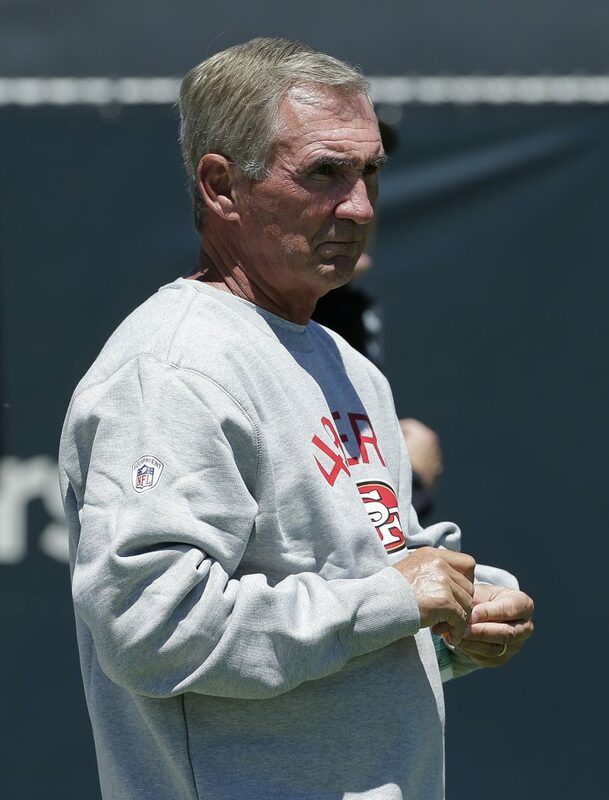 * That’s why Mike Shanahan is having the office attached to Kyle’s…..He’s the one supervising the offseason throwing sessions with Hoyer before training camp. Kudos to Mike for battling for the extra yard. 1. Will fans catch on to the fact that Seb is also Razoreater ? 2. Which one will be banned by Grant 1st, Seb or Razoreater ? 3. Why does Razoreater always appear in support of Seb, shortly after a Prime and Seb battle breaks out ? Seb’s answer: Colin Kaepernick….Does that mean Seb suffers from Robert Deniro’s, hero worshipping in his movie, The Fan, and is Seb, The Fan, ala, DeNiro ? 5. Will Seb claim, “I Win”, after every 49er play action Touchdown pass called byy Kyle Shanahan this year because Seb claims Kyle was trolling him. ? Grant’s not going to ban either. They drive traffic. Traffic leads to job security. It’s not in his self-interest to ban either. Seb licks Grant’s behind after every article. Def not See and I don’t get the feeling there are one in the same. I can’t stand Seb, but at least he is original and consistent. For the rest of the folks on here, it’s like Cheers all over again. It’s gross. Tom, these are answers to questions inquiring minds want to know! TrollD, you are trying too hard. No, Prime reminds me more of the ‘Fan’. His predilection to lose control, spew invective and violent epithet ridden outbursts describes Prime to a tee. Wish you would get a clue about how I determine if I win. If I can upset a poster so much that he resorts to expletives, I will declare victory. Looks like people are wising up, because I have not declared victory in a week or two. 49ers left tackle Joe Staley said he is having fun coming to work again, something he says he hasn’t been able to honestly say in the past few years. Staley has been blown away by coach Kyle Shanahan, calling him the most intelligent coach he’s ever been around. Well, I’m not surprised as, frankly, it’s been a lot of low-hanging fruit since Seifert was run out of town. But Shanahan really sounds intelligent, especially about offense. So much knowledge in such a young guy. One of the players who celebrated James’ interception was Reuben Foster, who gave James an enthusiastic and forceful high five. Why mention that? Foster used his right arm for the high five, the same one on which he had shoulder surgery earlier this year. Foster has been held out of team sessions to this point in order to avoid a freak collision. However, for the first time this spring, he fully went through individual drills, hitting and discarding the blocking sleds, etc. as hard as his teammates. Shanahan said Foster would be “more than ready” when the team has its first training-camp practice July 28. Good to be alive at our age, George. My wife just lost her aunt, and the ink isn’t even dry on her death certificate, and the nieces and nephews are fighting over her life insurance money. Putting more even more stress on her. I worry about the future with the selfish generation we have today, my friend…. Older vs younger generations…issues since the dawn of time. Nothing new. I can testify to witnessing the societal breakdown, and degenerative morals and values of people over just my 55 years of existence here on the earth…. I share this planet with you…same generation too. I heard my grandparents laugh and tell stories often about the ‘young generation’…those coming out of SoCal high schools at the end of the 30s–lazy, no work ethic, disrespectful, etc., etc. Then along came WWII. Parents of early baby boomers thought their kids were lazy, disrespectful, self absorbed, etc., etc. Hmm…. That’s my point. Each generation has gotten progressively worse. Well Razor (whomever…), we agree to disagree. Take the time and do some reading. I can give you an easy peasy example. Not sure your age, but have you noticed an increase in discourteous drivers on the road? Drivers in the ’70’s to nowadays are night and day…. WWII made that generation grow up quickly, along with surviving the Depression. All they knew was making sacrifices, more often than not doing without. Had to make very hard decisions based on fact, not emotion. In part, that “training” helped them figure out how to put a man on the moon and helped push forward Silicon Valley. Huge generalizations, I know………….I would love nothing better than to be proven wrong. Yeah, I’m with Cassie here. Razor, ever see “The Wild Ones”? “Rebel Without A Cause”? “Blackboard Jungle”? Back then some thought Elvis’s music was Satan’s own. Did you live through the ’60s? Your parents thought your generation (my generation as well) was going to hell in a handbasket. Even today some think metal is the music of degenerates. Guilty as charged, Razor? Each generation is the product of their surroundings and there is always a disconnect between them and the prior one. The generation gap has always been there and will continue to be there. Yea, I see it first hand every day. Work ethic, respect, morals and values, entitlements, courtesy. Baby’s raising baby’s, and the fatherless generation…. Baby’s raising baby’s, and the fatherless generation…. Razor, statistics say what you are seeing is confirmation bias. Or maybe in your case, bias confirmation? In fact, however, the birthrate for unmarried mothers, which had been steadily increasing since the early 1980s, peaked in 2008 and has declined 14 percent since, more than the decline for all women. The recent declines were sharpest among teenagers; black and Hispanic women; and those without a college degree — all of whom have typically had the highest rates of single motherhood — according to data from the Census Bureau and the National Center for Health Statistics. I sadly agree. But you are fortunate to be in Indiana, I mean that very seriously. Sorry about your wife losing her aunt and the stress, btw. Remember the Roaring twenties and the Lost Generation of that era. You read about that era and it can be shocking. Additionally, while the WW2 generation had to grow up quickly the advent of film noir does depict the dark underbelly of what went on in the moral underbelly of those who came home. Not everything was as rosy as we would have liked to believe. Additionally, the coarseness of social order has been something that has been increasing for some time and with increasing mobility its is easier to witness. Everyone seems far mor entitled and willing to express it. The internet has certainly has enlarged this dynamic but it’s been there to a great degree since the beginning of the national identity. When I was still a CPA I used to do Estate and Trust management. For about a year. By the end of the year I stopped. There is nothing like inheritance money to illustrate just how terrible significant portions of humanity really are. The final straw was some ***** who flat-out told me she’d put her mother with dementia out on the street unless she got $3K/month to cover her ‘expenses.’ There were no expenses besides her living in their guest room. She just wanted to milk her step-father’s estate for as much as she could until the trust ran dry. That was back in 1996. Now, I imagine it’s even worse. So, yeah, welcome to the ****-storm that is humanity. What’s happening to society is it’s being systematically dehumanized, if you ask me. I don’t think there is any doubt about it, but this is depressing, so I’m going to leave my computer, have a glass of wine, and watch MI-5. Have you ever watched it? It’s an old BBC series, and they do a really good job. My wife and I discovered it a couple of weeks ago, and there are ten seasons. We get it on Hulu. It’s also on Kodi, which I heartily recommend. I’ll check it out, George. Thanks for the tip. When I was younger I used to watch an old english show called, The Prisoner…. I really like MI-5, but when I recommended it to others, most were lukewarm. I’ve seen all of the episodes and there’s about eight to ten episodes per season. cubus, I think it’s great, although I’m only at the end of season 2. Need I say more than Keeley Hawes. Historians are going to blame OUR generation for it-we, in part, allowed it to continue. And they will be right. I have noted all too often the Magic Christian Effect upon family members in the face of the most pedestrian payout opportunities. Siblings cutthroat against siblings leading to 50 year life long feuds..
For those who don’t remember the Magic Christian movie, I am not dissing Christians; more like dissing us-uns. Players on both sides of the ball have expressed their amazement with Shanahan’s unique ability to break down a play from the perspectives of every player on offense and defense. Staley said he had one of those moments Wednesday during a team meeting when Shanahan dissected plays for both sides of the ball. Said Staley, “Even today we had a meeting, and I looked over at (Daniel) Kilgore – I was sitting next to him in a team meeting – and (said), ‘This is awesome.’ You get chills, almost. Staley said Shanahan is able to pinpoint the details of every play that determine why it is successful and articulate it in an easy-to-follow manner. Staley has been familar with Shanahan’s system for a while, he said. He has watched film of offensive tackles Trent Williams and Joe Thomas, who played in Shanahan’s offenses with Washington and Cleveland, respectively. Pretty much what happened to Lynch last year. Just another not so subtle warning to any of the players thinking they can lapse a bit over the next month. I miss the days off Baalke stashing losers on the roster for 3 years so Jed wouldn’t see how incompetent he was, then trading him to Cleveland, only to have the Browns release the player after 3 seconds of viewing a practice. I don’t know if you’re at all the pressers, but in the ones that you are present, can you put the name of reporter next to the question that they ask, please? You do it for yourself, and I appreciate that, but can you do it for others? Coming to camp overweight just does not impress me. Ooooh, Seb isn’t impressed. Heads will roll I’m afraid. CassieBaalke, EastCoast9er and Prime. Be sure to dot your I’s and cross your T’s…….Seb is watching with his thesaurus and a copy of Warriner’s. “And while the 49ers have clear LEO and SAM roles in base packages – on weak and strong side of the defense, respectively – nickel/sub packages require players to stay on one side of the field regardless of the strength of the offense’s formation. I have a modest proposal. KS should hire MS as the Offensive Coordinator. He has good experience, and he has worked well with KS before. Everyone is grown up, and egos will be moderated for the good of the team. Of course, this might make the scenario of Kaep returning an impossibility, since i think MS likes Kaep as much as Baalke did. Still, he might give the Niners good organizational input, and help them win. Ha! Its all about Kap and NOT the 9ers, Sebs!!! I’ll be darned if you aren’t a Raider fan!!!!!!!!!!!!!! You sly fox, you………….. Saw, when I said he would give the Niners good organizational input, I was talking about MS. Claiming that I am a closet Raiders fan is about as low as one can get. I have stated many times my hope that the Niners win multiple more rings. Kap will never be a 49er again. This is the Jed York appreciation thread. Thank you Jed for bringing Coach Shanahan. Thanks for the reminder, Jay. I’m liking everything I see and hear from Shanahan, and I thank Jed York for that. Of course, I thought Singletary was a bold, creative move, too… I wondered about his lack of coaching experience, but nobody doubts Sing’s heart and commitment to the game. Ooops. Still, this coach gives me hope, and credit to Jed for not giving up, and for swallowing the $$$ to put our previous bad choices on the couch. I will not give Jed too much credit. At least he was smart enough to get rid of Baalke, but the catalyst for all the improvements and optimism is solely due to John Lynch. Jed was floundering, going begging from city to city, getting humiliated, when competent GM candidates were turning him down. I certainly think that KS would have turned him down if Lynch was not there, and some other weaker less competent GM was installed. Jed was lucky. Lynch fell in his lap, and he had little to do with that move. I suppose Mike Shanahan may have been the initial impetus, since he wanted his son to succeed, and have strong support. Even so, the hiring of Lynch did not make the hiring of KS a done deal until just before the SB, especially with the Colts changing GMs. The Colts hired a GM who had turned down the Niners, and he may have hired KS from under the Niner’s noses, but Lynch saved the day. Jed should be complimented for getting rid of Baalke, and wising up enough to hire competent football people to run the team. He also should be complimented for keeping a low profile, and not giving many interviews. I will still hold him accountable for all the losing, because Jed told me to. Hopefully, now that the stench of Baalke is dissipating, the Niners can embrace the past, and get back to following the teachings of Bill Walsh. I hope to see little of Jed, and hear even less from him.